Renowned food writer Lauraine Jacobs shares her thoughts on The Village Table in this week’s Listener magazine. Lauraine has been a Matakana local for more than a decade, a time of incredible growth and change for the region. 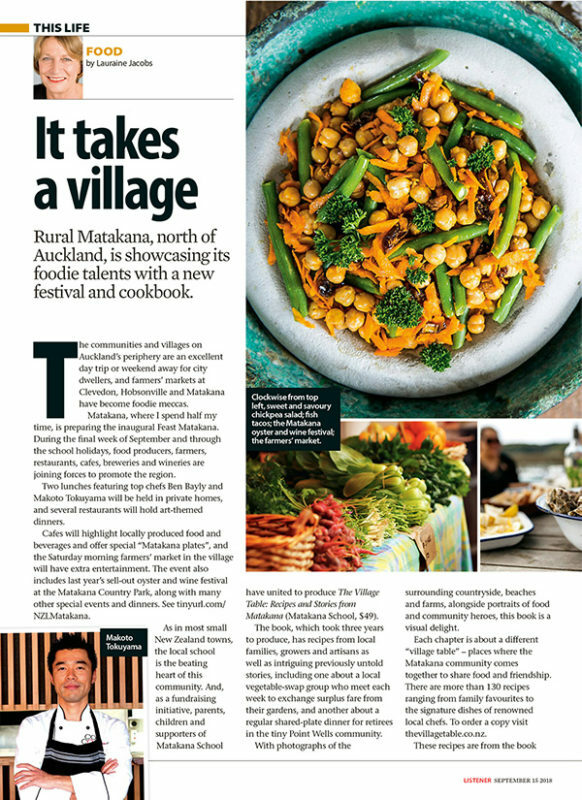 She shares her love for this special place and the rich Matakana food, art, wine and beer scene, in The Village Table. Surrounding countryside, beaches and farms, alongside portraits of food and community heroes, this book is a visual delight. Also included in the article are two recipes from the book: Fish Tacos and Sweet and Savoury Chickpea Salad. Download the article below to see them or buy the Listener! Lauraine has also just released her latest cookbook, Always Delicious. Check it out here. Congratulations Lauraine!